The Interorthodox Centre of the Church of Greece due to a lack of sufficient sources and information about the coexistence as a peaceful example of the two cultural and religious traditions in curricula, designed a training program for teachers titled “Learning and teaching about Judaism through the coexistence of Greek Christians and Jews”. This program was piloted with 25 teachers for the first time during the school year 2016-2017 and was implemented again next year (2017-2018) with a second group of teachers coming from primary and secondary schools. The educational project aims at 3 points: Learning, teaching and coexistence. 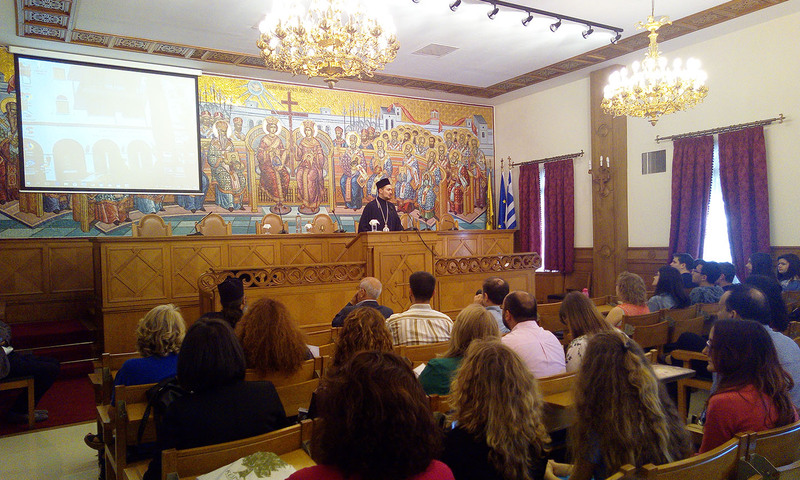 Our purpose is to encourage the teachers to teach about coexistence using the examples of the past, when Christians and Jews lived and worked together peacefully and, during the Nazi occupation in Greece, when Christian Ηierarchs, clericals and lay people in many cases saved the lives of Greek Jews. We use these examples from the past as a teaching material in order to motivate the young people on the issue of peaceful coexistence. Moreover the teachers deepen their knowledge on Judaism by offering them learning tools and innovative pedagogical methods to teach about these topics. Shortly after the beginning of the school year we run an intensive one-day seminar which focuses on items such as the history of Greek Jews, the attitude of the Greek Orthodox Church towards the Jews, the encounter of Judaism and Hellenism in late antiquity, the forming of the rabbinic Judaism, the cultural and religious traditions of Judaism etc. Τhe next day we visit the Synagogues of Athens, we have a special guide there and long discussions with Rabbi Negrin on all issues that arise. The day after we visit The Jewish Museum of Greece, we get a special guide there and we are been informed about the educational programs of the museum and about how one can teach the Holocaust. Then we have a follow-up meeting here in the Interothodox Centre and the teachers are working in groups on lesson plans and project plans that incorporate material and inspiration of our seminar and our visits. We help the teachers and we encourage them to implement these plans in their schools. We created also an online platform where the participants can find and use learning materials, information, best practices, videos and also other kind of materials concerning the subject of our program. All the above mentioned take place during the first weeks of every new school year because we want the teachers to graft the new season, to motivate the students and throughout this school journey we help them in their work by staying at their side either with meetings or online communication. In January/February, we organize meetings with the participants and they inform us and each other about how the implementation of their projects and plans goes, we talk about problems that might have occurred, we search for solutions and we exchange ideas and experiences in general by we receive feedback. During the year we arrange more optional meetings or visit, for example to the Synagogue of Athens on a Sabbath ceremony and on the celebration of Hanukkah. In May, before the end of the school year, we organize an open outreach event where teachers and the students themselves present the work they did in their schools throughout the school year inspired by our seminar. In this event, there are open discussions on the experiences of the program, we evaluate it and we start thinking about next steps. By this way, the teachers and their students have assimilated the values of peace and coexisting and become multipliers. The Interorthodox Centre of the Church of Greece supports this training program for teachers because we consider that the school education must help the students and the young people in general to build on a system of values for the society of today and tomorrow, a society based on the principles of solidarity, peace and coexistence. The program during the first year of its implementation was funded by the “Deutsch-Griechischer Zukunftsfonds”- die Finanzierung erfolgt aus Mitteln des Auswärtigen Amtes.